If you’re out to become the best golfer you can possibly be, don't neglect the grips on your drivers and irons. They don’t just help with the positioning of your hands, they also provide you with extra traction on a wet day and help you to feel more attuned to how your clubs interacts with the ball. Don't forget the best golf balls. Fore! When it comes to choosing the best golf grip for you, the most important things to think about are the size of it and the material. In simple terms, the size of the grip should relate to the size of your hand but as Golfalot explains, there’s more to it if you’re serious about golf. One of the most popular materials is rubber with its firm and adhesive properties, while those who tend to suffer with sweaty hands may want to look into a corded golf grip like our top all rounder, the Golf Pride MCC Align. 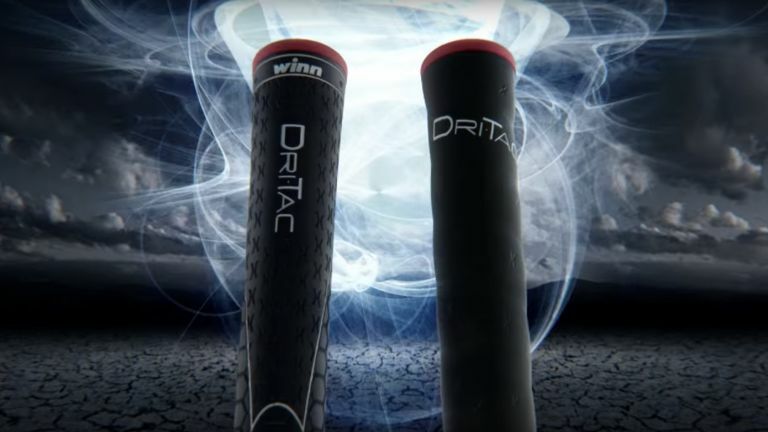 There are also synthetic options such as PU and polyurethane which tend to be more expensive, or cheaper polymers, such as the Winn DriTac if you’re looking to kit all your clubs out for a cost-effective price. If you’re looking for the perfect all weather grip, this golf grip from Golf Pride has you covered. Thanks to the combination of cord and rubber, this grip delivers on traction in both wet and dry weather conditions. The use of the Align Technology micro-diamond ridge surface with carved channels ensures a firm, confident hand placement, making it a great all rounder that won’t set you back too much, either. Thanks to the use of intelligent SuperStroke parallel technology, this golf grip enables you to apply even pressure with both hands, which takes away tension in the wrist and forearms. In doing so, there’s a greater chance of consistency with each shot that you take and golfers can really master that ‘pendulum putting swing’. The lightweight foam underlay improves the feel of the way in which your hands interact with the grip and provides that tackiness that ensures a firm grip, whatever the weather. Having been designed to sit comfortable in your hand, this is the ultimate option if you’re really looking to master your putting swing. Thanks to the light-traction surface, you can expect to experience more feedback from your putter, allowing you to perfect your technique. With each side of the grip having a parallel plane, the golf grip assists you in ensuring that your putter is square to the ball. If you prefer a softer grip, try the Golf Pride CP2 wrap grip for size. Thanks to the control core, the grip helps to reduce torque by 41%, while the soft rubber and textured outer provides both comfort and traction for a solid swing. To ensure your hands are in the optimum position, the grip comes with a reduced taper, which should encourage lighter grip pressure. With its pistol shaping ensuring all hand sizes are catered for, the Odyssey Jumbo is more than just a golf grip for large hands. If you struggle with wrist movement, especially on the putting green, Golfalot suggest buying a larger grip to help keep your hand position in place. The grip also features a slip resistant surface and a soft construction to increase traction. With heaps of five star reviews and many users commending the quality, the Odyssey Jumbo is a great option. You don’t have to spend lots of money to invest in a decent golf grip. This one from Winn DriTac is made from a polymer that balances cushioning and comfort for a solid grip in all weather conditions. Users seem to love the feel of the grip but have trouble removing them in one piece, which is one of the compromises if you’re looking for cheaper grips to kit out your entire club set.